Overall similarities (OS) perceptual maps (which are also sometimes referred to as gap maps, or even a proximity matrix or a distance matrix) are another variation of producing a perceptual map. These maps use a different form of data input – asking respondents how similar brands are, rather than asking them to rate attributes. Please note: If you want to produce a standard two-axis perceptual map, then you should go to the download page. If you want to make and understand an Overall Similarities (OS) perceptual map, then stay on this page. A video on how to use the template and interpret overall similarities (OS) perceptual maps. An Overall Similarities (OS) perceptual map is simply another method of building a perceptual map. Consumers are asked to compare how similar the brands/products are in their view (or their perception – hence it creates a perceptual map). For example, how similar are McDonald’s and Burger King? How similar are McDonald’s and Pizza Hut? And so on. The output perceptual map does NOT contain axes or axis labels. The brands/products are just plotted relative to each other – either close to or far away from competitors. Why Use an Overall Similarities Perceptual Map? Overall similarity perceptual maps are helpful if you are unsure of how consumers think about and distinguish between the offerings. That is, you are not sure of what are the most appropriate product attributes to use on a standard perceptual map. Whenever you provide consumers with set attributes to rate brands/products, you are limiting their choices and views to these specific attributes (note: attributes are benefits and product features). However, by eliminating attributes in the survey you can see how consumers (across different market segments) connect and associate the competing brands and products. Hopefully… you will uncover some new information on how consumers think and relate brands in this product category. As stated above – there are NO labels on the X and Y axis – in fact, there are no X or Y axes produced. This means that by using this technique, you will need to work out HOW the consumers think, classify and different between the competitors. Here is the free Excel template for an OS perceptual map for download. Note: Requires Excel 2010 or later. This is the tricky part and it may take a little time to figure out the underlying dimensions of which factors are driving the consumers’ perceptions. 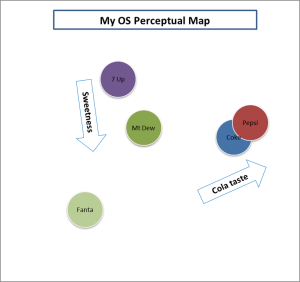 Let’s look at some examples of an OS perceptual map as produced by the free template map. This is the output of five soda (soft drink) brands. Note that there are NO axes or labels. The next task is to work out the underlying influences. A possible explanation is shown below. However, ANOTHER possible set of consumer-based perception factors are shown in the next version of the map. You should note that this is the SAME map – but two different attributes have been identified. 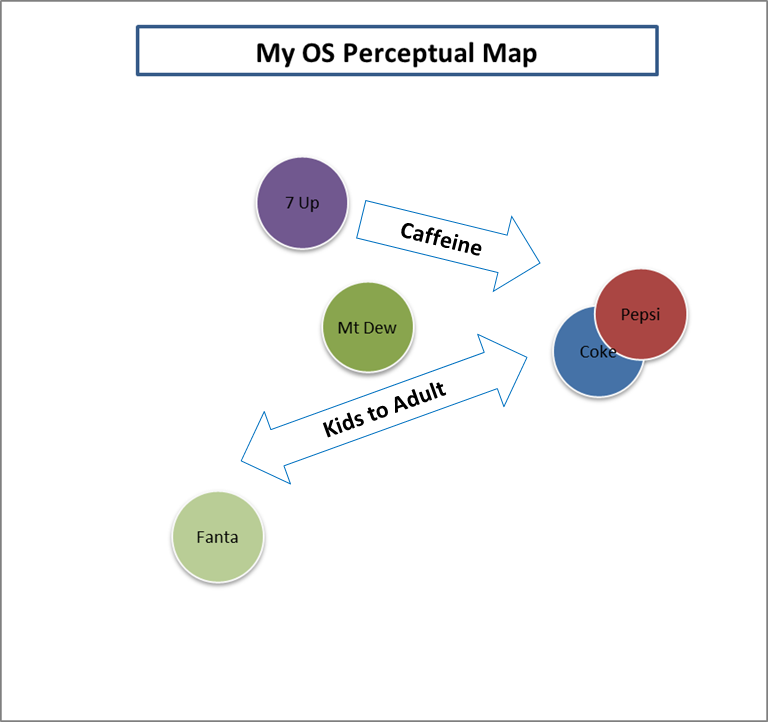 And it is even possible to build in more than two factors – as shown in this OS perceptual map.